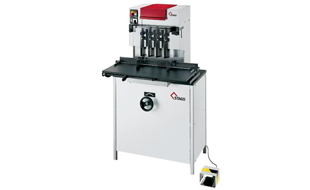 Paper drilling machine with 1-5 spindles as stand version with automatic spindle stroke via foot-switch. Long-term high performance and absolute precision. This sentence describes the basic concept of the PB 5000 machine series exactly. The performance speaks for itself: up to 5 high-performance drill spindles, a drill diameter of 2-10 mm, a maximum stack height of up to 60 mm, machinable materials: paper, cardboard, textiles, leather, and plastics. All Stago Drilling Machines are exclusively 'made in Germany'. A consistent high manufacturing standard guarantees you reliability and functionality for daily use. Robust mechanics, durable materials and ergonomic design are warranties for the perfect long run function of all Stago machines. Interested in the Stago PB5010? Contact us to see what this Paper Drill can do for your business!